There is only one ticket left. Don’t be left out! Tickets are $40 ($45 for non-members). You may contact Nancy Wilson with questions at nanwil60@aol.com. Please be at the Madera Clubhouse at 8:30am for check-in and no later than 8:45am to board your bus. The buses will depart from the Clubhouse promptly at 9:00am on Monday, March 28, and return around 4:00pm. If you plan on purchasing tickets for margaritas or wine at lunch, please bring correct change as we will not be keeping a bank on the bus. Thanks for your help with this! There will be free time to visit the gift shop and/or explore the zoo on your own. Your bus “leader” will explain where you will need to be when. NOTE: The arrival time at Madera Clubhouse has been changed to the correct time of 8:30am. This time is different than what you received in your email message on 3/18. The polo shirts in the style we have purchased in the past are on clearance with the only sizes available being small, medium and large. Peggy McGee is looking into another vendor that has the same style in the same color and in the same price range. As soon as she hears something, we will let you know. If she can find another vendor in the next couple of days, we will see if they can be here in time for the zoo trip on March 28. The Scholarship Committee is thrilled to announce the winners of the very first TWOQC Scholarships! Kayla Christiansen, from Sahuarita High School, and Caroline, Carly, Frieders from Walden Grove High School will each receive $1,000 scholarships to the post-secondary school of her choice. Each winner is an outstanding student and an exemplary representative of her school. Involvement in both their schools and their communities is a core value of each of these young women. You will learn more about these impressive young women in the weeks to come. For now, plan on meeting them and hearing more about what these scholarships mean for their futures at our April program on April 25 at 6:30. We have a new baby born on 3/14! Miss Tianna Mariela Soto has arrived 2 weeks ahead of schedule! One of our Military Mom’s has had to remove herself from the shower for personal reasons. We wish her all the best! Our new numbers are: 11 Military Moms, 18 Military Dads for total of 29. Our Baby totals have changed to 30: 6 boys, 13 girls and 11 unknown. The latest “Challenge of the QC Units” is underway! We are happy to report donations are already coming in from the different units! Thanks so much for participating. Please remember the upcoming Zoo Field Trip. We appreciate any of you who choose to donate your loose change, bills, checks for the Baby Bottle pass on the buses! This is a great way for young parents to start a savings account or for Baby’s College Starter Fund! If you would like to donate your time our next planning meeting is Monday, April 4th at 11:00am in the Kino Conference Center. Please contact Pamela Rodgers with any questions at 520-561-7969 or prodgersaz@gmail.com. Donations may also be dropped off at her home, 2640 E. Sawyer Road (drop box on front porch) or call she will be glad to pick them up in the Quail Creek/Green Valley area. You will also find collection boxes at the Madera Clubhouse lobby and the Anza Fitness Center. 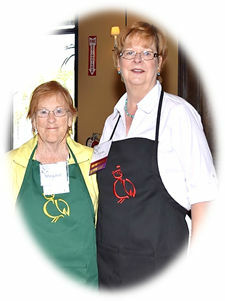 Margaret Morris & Diane Quinn sport two of the apron colors. If you didn’t get a chance to purchase an apron at the 1st Annual Spring Festival Arts ‘n Crafts Show and want one before our next program, please contact Peggy at pjmcgee@cox.net or 520-207-6188 to arrange for pick-up. If you are going to someone’s house for Easter, you might consider an apron to take as a hostess gift. Aprons are $18 or 2 for $35 and are available in 6 different colors. All proceeds going to Youth on Their Own, a non-profit whose mission is to keep homeless teens in school. The team of volunteers at TWOQC’s table at the Spring Festival last Saturday sold 38 aprons for the YOTO project! 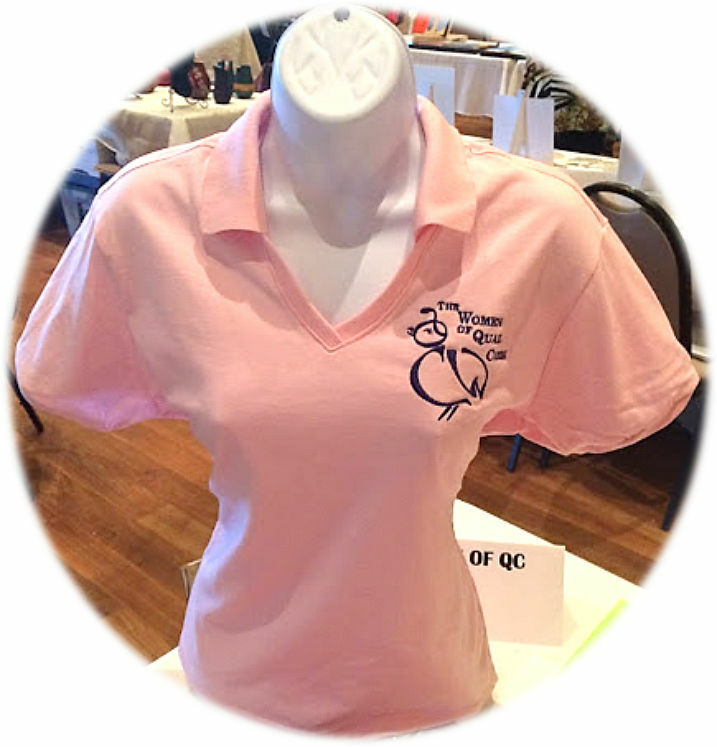 Thank you to Peggy Brown, Karen Petzel, Pat Neel, Rena Craine, Peggy McGee and Nancy Wilson for taking time out of your Saturday to sell our quail-logo’d aprons. Great job, ladies! View the photos: APRON SALES. We are still looking for two members that would work on a special “Survey Committee.” TWOQC would like to create and submit a survey for all of the members to be able to express their likes and suggestions for the club. If this is something you would enjoy creating and participating in please contact carolmutter48@gmail.com. April 25 – 6:30 pm …Prickly Pear Cactus presented by Cheri Romanoski, and TWOQC Scholarship Award Presentation. You might start preparing for our semi-annual collection for the food bank. We will be taking donations at this program! June 27 – 12:30pm …Summer Luncheon: The Arizona Balalaika Orchestra will be performing under the direction of Mia Bulgarin Gay. 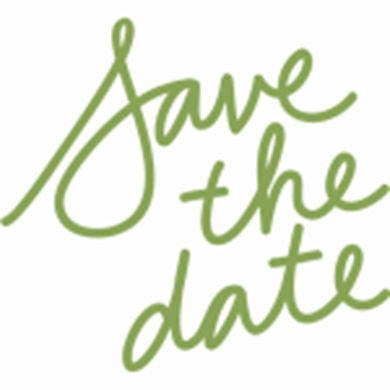 Tickets for the lunch will go on sale prior to the May 23 program. Get your plans made – only ten seats at a table please! 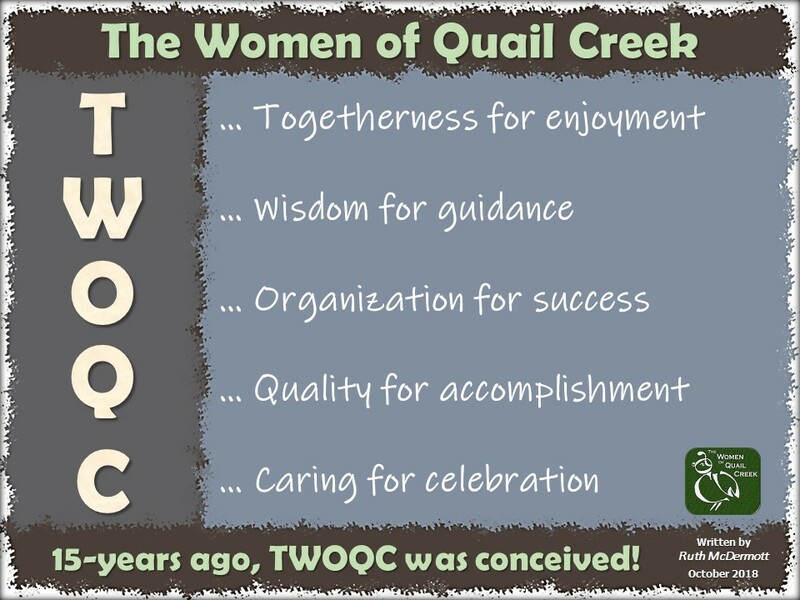 Have you seen the 20+ posts just the past couple months on TWOQC’s Facebook page showing our events and community involvement? Social media is a popular place to boast and brag about all that we do, who we are, and what we accomplish. Jim Gressinger from SouthernArizonaGuide.com (personal recommendations for the BEST dining, lodging, and things to see & do in Tucson and all of southern Arizona) was our program last November (Best Hidden Treasures). Jim extends an invitation to TWOQC members and their friends/family for a Ghost Towns Tour coming up on April 6. Click HERE for reservations deadline, to purchase tickets and general information. Detailed itinerary flyer: GHOST TOWNS TOUR. Questions? Contact Jim Gressinger at 520-820-2710 or Jim@SouthernArizonaGuide.com.